Nothing beats getting your family and friends together for a little friendly competition, especially when you can involve everyone. With RoosterFin, your game night is about to be taken to the next level! 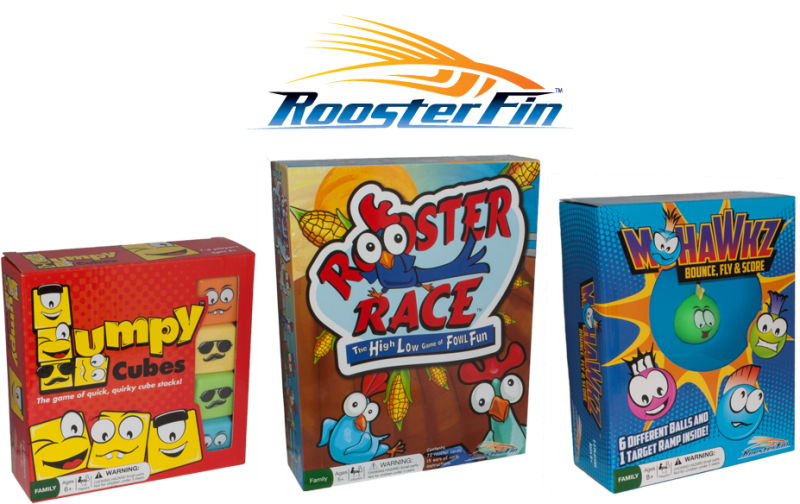 The lineup of RoosterFin games are simple to learn and easy to play. Started by a former math teacher, each game has an educational purpose, but your kids will probably not even notice with how much fun they will be having. With games like Rooster Race, Lumpy Cubes, and Mohawkz, be prepared for a fun time with lots of laughs! Tryazon will choose 250 hosts for this party opportunity! Those picked will have the opportunity to receive a party pack with samples to showcase to friends and family in October. Learn more about the products and party by clicking the tabs below. RoosterFin Games are easy to learn and simple to play. Every game has a fun, educational twist for kids! 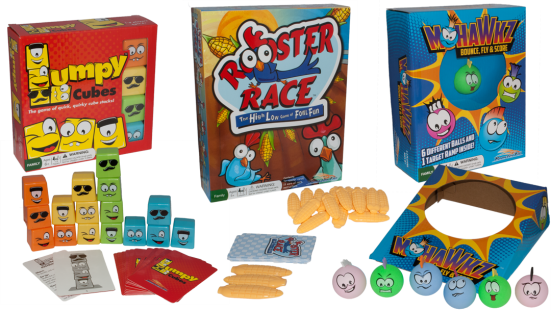 Help your roosters gather corn in this high low game of fowl fun! Rooster Race™ is a fun simple card game that suits all ages, from kids, teens, college students, parents, and grandparents. If you can count to 15, you can play Rooster Race™. The object of the game is to make educated guesses; to predict if the value of the top card in your card stack is higher or lower than the last card played by your opponent. If you have ever played war or blackjack, Rooster Race™ will be your next card game favorite for family game night! It's up to you to help them gather corn by correctly predicting if the number on your racer card is higher or lower than the lead racer. It's an exciting game of fowl fun from start to finish. Founder Joe Balcuk brings a unique skill to the toy and game industry with his ability to write authentic game engines. His gift is in understanding how math applies to games. Joe's background, coupled with his years teaching kids, enables him to create games that are continuously simple to learn and fun to play. Use #tryazon and #roosterfingames to include your tweet on this page! The fun begins in late October, when parties will be hosted. My family is always looking for a fun new game to add to the family game night roster and when we heard about Lumpy Cubes, we were intrigued and just knew we had to give it a try!...This is an easy game to follow and provides tons of fun with a bit of developmental learning secretly thrown in! Great for kids!